Google Street View APK 2.0.0.129283773 is a useful application from Google Inc that you can use to monitor your neighborhood. In the past, this application is only available in desktop version. You can only see the street from your computer. However, after getting success on desktop version, Google release the smartphone version. This is available on Google Play Store under Travel and Local categories. 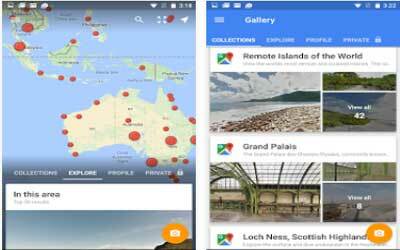 By using this Google app, you will be able to explore various spots in the world without having to be there. You can also use it when you are looking for a house to purchase. Besides used to explore and browse your surrounding area, you can also use it to explore famous landmark over the world. Discovering natural wonder can be done effortless from your smartphone. It allows you to enter museums, restaurant, or business office. Users are also able to upload photosphere by using Google Street View. The system used on it allows you to take those photos with your smartphone camera. This process only takes a single tap on your smartphone screen. A 360-degree photography that you capture can be published to Google Map. Users from other part of the world will be able to see the surrounding area through the uploaded photos. It features notification update if there is new collection added to the gallery. You can both manage and review the photos that you are uploaded from your profile. If the photo contains classified image, you can put it on private. Therefore, only your friends are able to see it. Cardboard mode is also available if you want to see it in different way. In-app purchases are not implemented in the application. Therefore, you can enjoy all features it has to offer. Unfortunately, Google Street View for Android is only available for smartphone with Android KitKat operating system or above. Published fifty 360 photos? You’ll get invited to join Local Guides and be listed as a trusted pro for hire. You can now transfer your Maps-approved 360 photos to others.